In Diving Gozo & Comino, local dive guide and instructor Richard Salter shares his detailed maps, experience and advice for 71 sites. Photos above and below water, depths, durations and grades are given – Easy, Advanced or Technical – to help you choose where to dive. Gozo, Malta, has a multitude of underwater attractions to explore from the shore or by boat. Divers can see breathtaking caves, tunnels, wrecks, reefs and bays. If you consider the profusion of marine life and good visibility it is not hard to understand why the diving here is consistently voted amongst the best in Europe. Richard Salter’s Diving Gozo & Comino covers a huge 57 dives on Gozo and 14 on Comino, including (to name a few) the Blue Hole, Inland Sea and Tunnel, Santa Maria Caves, Double Arch, Reqqa Point, Billinghurst Cave and the wrecks Cominoland, Karwela, Xlendi Ferry and P31. The author’s painstakingly researched and drawn dive site maps include suggested routes, the location of underwater caves and swim-throughs, depth and features. Photographs from a variety of contributors show both Gozo’s underwater scenery and the topside landscape. Written by a vastly experienced resident instructor and guide, Diving Gozo & Comino: The essential guide to an underwater playground features both shore and boat dives, including some sites which are very rarely explored. 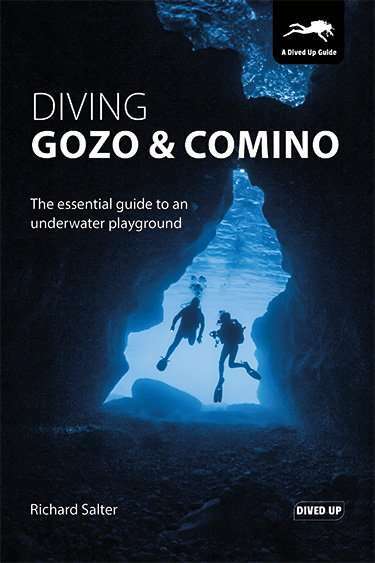 Whether researching a self-guided trip or diving with one of Gozo’s many professional centres this book will help you to pick and plan safe and fun dives. But not only that – Diving Gozo & Comino also contains information about the island’s rich history, fascinating tourist sites, celebratory village festas and delicious original food. * Diving Gozo & Comino includes changes caused by the 2017 collapse of the Azure Window at Dwejra. Although an incredibly sad loss, this natural event was just one of an infinite number which have sculpted the coastline of the Maltese islands over the millennia, as divers can see better than most. Underwater the layout of the dive site was altered with the landscape containing new swim-throughs and shallower parts, making it accessible to more divers. The adjacent Blue Hole was unaffected. Richard Salter is an instructor and dive guide who started diving the Maltese islands in 2004 since when he has amassed over 5000 dives, mostly on Gozo and Comino. After finding accurate information hard to come by and existing publications lacking, he started to draw his own dive sitemaps, so that he could show divers the best places to go, depending on the kind of diving they wished to pursue. He also learned some local history. Now he shares his knowledge so that others can safely enjoy all that Gozo and Comino offer.